Hey guys. Not sure if you knew but water intake is pretty much THE MOST IMPORTANT THING EVER. It affects how you feel, how you look, and your overall health, weight, and energy levels. And of course we know (and despise the fact) that hangovers come from dehydration (FML). We’ve all heard the “eight glasses a day” spiel, but let’s take a look at some other factors to consider when it comes to your H2O game. 1. Drink a gallon a day. Ok ok I KNOW this sounds crazy, but hear me out. If you can manage to drink this much water for just a week, you will 100% see and feel the positive changes in your body and it will be just as good (or better) than any detox you could do. Just ask Gabrielle Union (and my mom) who are aging backwards. Direct quote from Gabs: “I started drinking a gallon of water a day in my mid-thirties. It changed everything from weight maintenance, to hair, skin, nails, and digestion.” Um, SOLD. If I can recommend one thing to make daily water intake easier, it’s the magical S’well bottle–it seriously keeps beverages cold for 24 hours (read: you can leave it in your steaming car/on the beach all day and still have ice cold water). 2. Drink in the morning. This no-brainer made the Internet rounds recently and it was a “yeah duh” moment for me as I always wake up and drink water. But tipping back at least 16 oz. of water before you put anything else in your system in the morning works wonders for your metabolism and body/brain health and flushes out toxins. (Fun fact: My boyfriend woke up one morning last week and popped open a Diet Coke before anything else and I pepper sprayed him.) Aqua in the a.m. can also help you eat less throughout the day. 3. Water can curb hunger/unnecessary snacking. If you’re having a hunger pain or feel the urge to eat, you might just be thirsty (and no, not like that). Drink 16 oz. of water and see if the urge subsides. But of course, always listen to your body; if you are actually hungry, it means you need to eat (going into starvation mode slows the metabolism down, duh). The trick is knowing the difference. 4. Temperature. There are numerous debates and so much information out there regarding which water temp is best. The truth of the matter is that all water is good for you. But drinking hot water (and especially hot water with lemon) can seriously aid in digestion and even prevent infections/illness. As for cold vs. room temp, our pal (and health and fitness expert) Cara Weaver says, “Warm or room temperature water reaches your system faster, while ice cold requires some energy to warm it up before hydrating you. Tip: Before or after a workout, go with room temp water for hydration purposes. 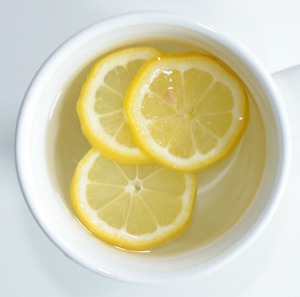 At work, make it ice cold so you burn calories warming it up in your system.” Personally, I love cold water and will always prefer it, but I hop on the hot-water-with-lemon train every so often (especially in the winter) and am definitely a believer. So drink up, drink often, and drink way more than you probably think you should. THIS is the beverage that does a body good. Gabrielle Union image credit; feature image credit.